Wembley Stadium has refinanced the loan taken out to fund the redevelopment of the English national football stadium. The deal relates to the remaining loan of £341.5m from a £426.4m financing package secured in autumn 2002. The stadium, a subsidiary of the FA, said it had secured a more favourable interest rate on debt and extends the term of the loan from 2018 to 2023. It comes as Wembley emerged as favourite to host the 2011 UEFA Champions League final. In an effort to lure the final to Wembley, the government has said that players on foreign teams will be exempt from any tax. 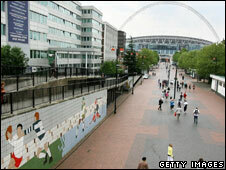 Announcing the refinancing deal on Friday, Wembley Stadium said the move would result in savings of roughly £3m a year. Refinancing was jointly led by the lead bank for the original financing package, West LB, as well as Barclays Commercial Bank. There was also financial support from The Royal Bank of Scotland, Lloyds TSB, Bank of Ireland and Banco Espírito Santo. Alex Horne, the FA's Chief Operating Officer, said the refinancing came at a difficult time for the financial markets. He said the move reflected "the high level of confidence that the banks have in the venue delivering its business plan". The new Wembley opened its doors 18 months ago, and has now hosted 50 major events, and had 3.5 million visitors. "It gives us particular satisfaction... to have closed this deal in the teeth of the most challenging conditions we have ever seen in the credit markets," said Chris Heathcote, global head of infrastructure at West LB. After two years of heavy losses, Wembley is expected to return a significant profit from next May. In May the stadium posted an operating loss before interest and tax of £21.2m for 2007 - the first year it was open for business, but is expected to move into profit from next May. The north London stadium was due for completion in August 2005, but its development was beset by problems.